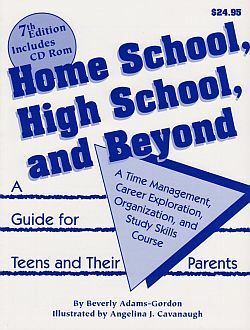 Home School, High School and Beyond is a time management, study skills, and organizational how-to book written specifically for home schooled teens and their parents. All the information needed to organize and document home school experiences in the high school years is provided. It not only shows how to translate real life experiences into high school credits, it teaches how to create courses based on interest areas. Keeping home school, high school records organized is easy using the reproducible forms provided on the CD. Teens are guided through the process step-by-step. Making the most out of study efforts and evaluating results are covered in detail. Daily planning and time management is also covered in Home School, High School and Beyond. Post high school education -- making choices, getting in, and paying for it -- is an underlying theme throughout the book. This is a must read book for every home schooled teen! In addition to printed copies in the book, a CD-ROM with all the reproducible forms and Learning Standards is included with your book. "I also liked seeing someone design a course for the student to take responsibility for their education. It gives them ownership of their education. This is what it will take for young people to be prepared for college and the workplace. They will need to be independent and be able to take initiative." Jewel Smith, Herald Five, SC Home Education Assoc. "Any student who completed this course and stuck with the system for the high school years would be amply prepared for adulthood (and far more organized than most of us, I'll bet.)" Paige Smith, Live & Learn Newsletter, Humboldt, CA.